If you’re a champion Spot-The-Difference player you may have noticed a new little icon has appeared on your Facebook business page when you go to publish a new post. Facebook Live Video has arrived! Originally only available to celebs in 2015, the video streaming option is now available on mobile via personal profiles and business pages, making it incredibly easy to take advantage of the growing trend for live video, started by the Meerkat app last year and since helped by the popularity of Periscope. The number of users seeing content shared by business pages on Facebook has been dropping steadily for years, with now only around 6% of your audience being presented with your posts in their newsfeed. So if you have 1,000 likes on your business page, you’ll be lucky if 60 people see the content that you lovingly craft and publish every day. Frustrating, right? But there are certain types of post that are working well in boosting organic reach last year and in 2016, one of which is video. Studies have shown that videos uploaded straight to Facebook are enjoying 2.5 times the views of those shared from elsewhere, and videos are also enjoying more shares and views than other types of post. 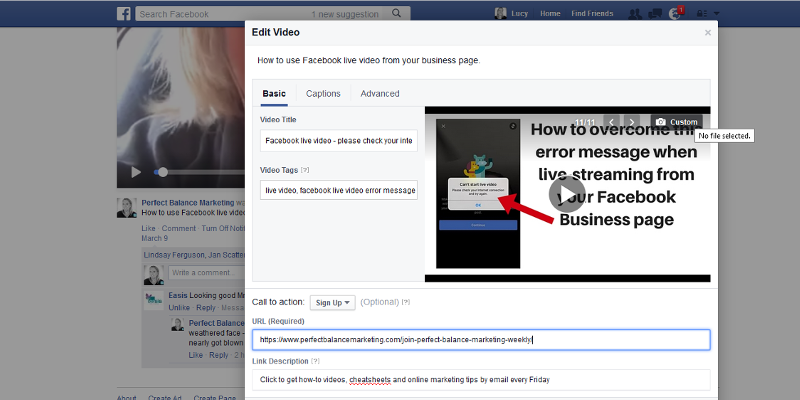 This wasn’t a rigorous research project, but it’s an indication that Facebook is currently favouring live video so it’s the perfect time to jump it and try it out for your business. UPDATE: Facebook have confirmed that they are ranking live video differently to other native video uploaded to Facebook – “People spend more than 3x more time watching a Facebook Live video on average compared to a video that’s no longer live.” See more from their newsroom here: Newsfeed update re live video streaming. As soon as you go live, your ‘fans’ will receive a notification that you are broadcasting, inviting them to come and join the conversation (but this is changing – and soon! See troubleshooting below). 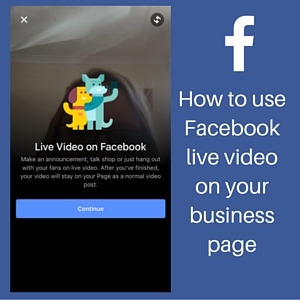 To broadcast your first video, simply visit your Facebook business page via the Pages app on your phone, click ‘Publish’ below your cover photo, then click the small icon at the bottom of the text field and hit continue. There are a couple of things to consider before you pick up your phone and start broadcasting. Here are some things you can do to make the most of the opportunity of live video. Each time you stream a live video you can add a description which explains what you’re talking about. This is the first thing people will see when they get a notification that you’re live, so make it descriptive so it’s clear what you’re covering, but also make it attractive so people want to watch. During a live broadcast, a button displays on your video inviting people to subscribe to your live broadcasts – mention this and give people a reason to click it! Rather than relying on passing traffic, tell your connections when you’ll be live on Facebook and what you’ll be talking about. 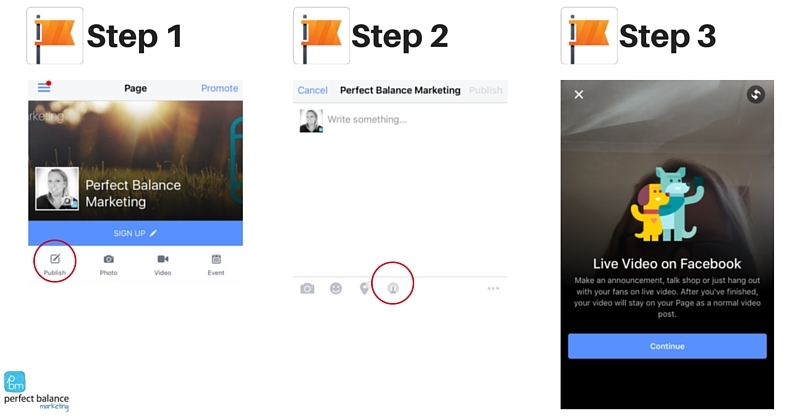 Post a notification to Twitter, email your list, share the time of your broadcast with your Facebook audience in advance so they know when to join you. You know how much competition there is for our attention online, with notifications, emails, pop-ups and constant distractions tempting us away from whatever we’re doing. This is never more true than with live broadcasts, when the slightest lull will result in your audience leaving your page before you can say “Hello and welcome”. Stay focused, speak clearly, avoid waffling, and stick to your content plan. Once you’re live, people can ask questions and comment on your broadcast – eek! Scary – but also a great opportunity to make them feel extra special and show you’re listening – mention them by name, read out their questions before responding, and let them know how much you appreciate them for being here live. There’s plenty of other things they could be doing! After your live broadcast has finished, the video will be available in the videos section of your Facebook page (normally in the left column). Facebook will choose a thumbnail image to go with your video but you might want to choose a different one, in which case simply click the date above your video and choose one of the ten thumbnails available. If none are ideal, you can upload your own custom thumbnail image by clicking ‘Custom’ in the top right hand corner. You can even add a call to action button too, linking to a page on your website. Once you’re happy with your thumbnail, description, tags and call to action, simply save your changes. As with any new feature, Facebook live video has a couple of potential challenges. The first time I tried using the feature, I consistently saw this error message. Beyond annoying. My internet connection was fine, I was using it to browse the net, respond to emails on my phone, and was also using wifi on my desktop computer, but still Facebook was asking me to check my internet connection. Thankfully there is a workaround – if you see this (irritating) message and you run all the usual checks to make sure your wifi is working fine, instead of accessing your business page via the Pages app on your phone, access it via your personal account (simply click ‘More’ – see below) on the main Facebook app and go through the steps above to broadcast live – the error message should magically disappear! Another potential problem is a weak wifi signal, which can cause your live broadcast to stop streaming – if this happens, don’t panic. 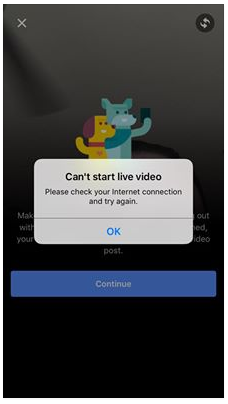 Facebook advises you to simply go somewhere else for a stronger signal – easier said than done – but rest assured that your live video will still be archived on your business page to access later and you can simply pick up where you left off when the signal is stronger. 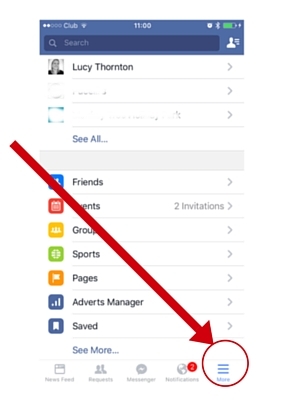 Facebook currently notifies users when a page they like or follow is broadcasting live – recent reports suggests that users find this overwhelming so Facebook have announced that they will shortly be removing this feature to improve the user experience (find out more here). People will still be able to request notifications but won’t necessarily receive them by default. Although live video is available to pages and on personal accounts, the feature is not available in groups. 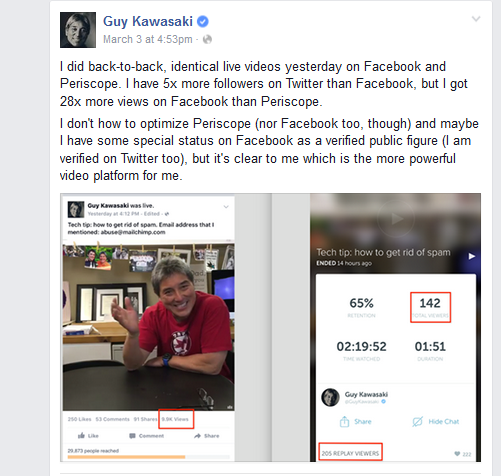 So Facebook live video is a big deal – it’s currently a great way to reach more people, and show a little personality behind your business. Have you tried it yet? I’d love to hear your experiences – share in the comments below.